This blog promotes perceptual or ‘optical’ photography as a parallel stream to ‘subject-based’ photography. There is continuous, if often submerged, history behind this stream, dating back to Julia Margaret Cameron’s ‘out-of-focus’ portraits. Internationally in the 1960s photographers were conducting perceptual experiments, comparing or differentiating human and camera vision. In the United States these include Minor White, and at the Chicago Institute of Design (born out of Lazlo Moholy-Nagy’s New Bauhaus), Harry Callahan, Ken Josephson, Ray Metzker. This interest is reflected to varying degrees in Bill Brandt’s nudes and landscapes in the UK, with echoes in Australia in the work of Mark Strizic. Some of it diverges from formalist modernism and was instead driven by philosophical concerns and particularly the influence of a trend to seek spiritual renewal in Oriental belief systems, especially Zen Buddhism. Such interests can be traced in the contemporary abstract expressionist painting but it is ironic that so literal a medium as photography might lead efforts to create images of spiritual abstraction. “The No-Focus and the Zen awareness can produce a photograph of simplicity, power, interest, and the intuitive realisation on the part of the seer or viewer that he is seeing more than he realises” Meatyard quoted by mentor Van Deren Coke (Tannenbaum, 1991). 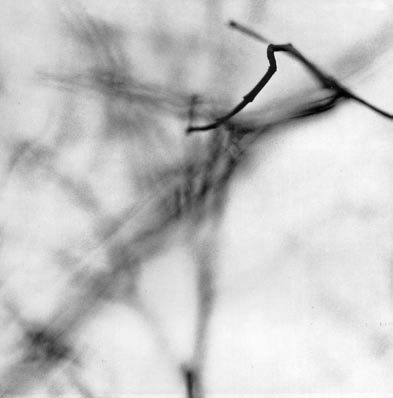 In one example (1963) of the (untitled) “Zen Twig” series we see spaces and voids vacillate. Lines ghost, flare, flicker and fuse across the square format in an apparently non-objective, abstract array which was then mostly unexpected of this medium, but with which Meatyard had experimented extensively in the (1960) “No-Focus” series, begun a year earlier, in which he eschewed any point of focus. But here a dominant delineation or section of arc is seemingly forced sharply into point of contact with the surface of the print. It is at this point that we recognise that what we see is in fact derived from real objects. The print seems to be a direct translation of the ground glass, as if there is no lens and twig is placed directly against glass. The effect of this concise focus against the tender ground materializes, with full force of the sense of touch, human consciousness of twig. Knowledge of this work illuminates the more celebrated series (1969-1972) of theatrical fictions around “Lucybelle Crater”. These seem to be anomalous or even deliberately perverse, or at a stretch they might be related to other maskers’ appearance in the ruined buildings in which Meatyard so often posed his sons for experimental slow-shutter or shallow-focus photographs like the posthumously titled “Child as a bird” (1960). But they relate to and continue these perceptual concerns. Created during the course of his terminal illness I suggest the last masquerade might revive the Classical subject of “Et in Arcadia Ego”, though here it becomes “Et in Suburbia Ego”, bringing a comic Zen response to the presence of death in his bucolic surrounds in Lexington. But the Lucybelle series also plays with our sense of perceptual certainties. Billboards in any art are the first things that one sees. The masks might be interpreted as billboards. Once you get past the billboard then you can see into the past (forest, etc. ), the present, & the future. I feel that because of the “strange” that more attention is paid to backgrounds and that has been the essence of my photography forever. While the “backgrounds” mentioned here are for Rhem an indicator of the importance of family and personal history, one can see in Meatyard’s work the significance he placed on the environment as a symbol of the eternal in relation to the mortal. This is interesting. For some reason, abstract photography is becoming topical, there seems to be more about it now than I can recall. I love Meatyard, one of the ‘apostles’ for me, but at the moment Concrete Photography is catching my eye. I’ve been looking at Gottfried Jaeger’s work. Do you know it?